You are lucky in life if you can meet someone who is both great and good. 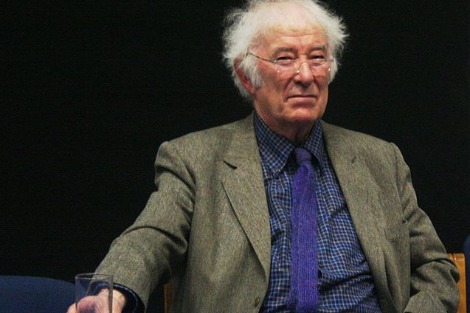 Seamus Heaney, the great Irish poet, was such a man. In 1978–79 I had study leave and decided to go back to Harvard Graduate School of Education (I had been there previously in 1963–64) to undertake what was described as a 'mid-career' course, a certificate of advanced studies. Fortunately my advisor suggested that I should avoid any course that involved 'schools'. So I undertook philosophy and allied courses, and an advanced poetry workshop. This later was to have Seamus as the instructor. He was a man of extraordinary generosity, a critic who could make adverse findings seem like winning lottery tickets. I knew I wasn't a great poet, and he knew it too, but he also knew I liked curling up in the word. He gave me an 'A'! His generosity was no more apparent though than when he agreed to contact an Aboriginal student whom I believed would become a good writer. He sent him a signed poem. He loved oysters and several times we ate them together at 'One Potato, Two Potato' in Harvard Square. For him a good oyster was like a good word — palpable (he loved that word), firm and sweet, fresh and briny-laden. When he was here for the Melbourne Writers Festival in 1994 I had breakfast with him and an old school friend of his who lived in Melbourne, Paddy. It was all lilt and love. I sat entranced. He charmed Melbourne and found much that was good in Australia. When he was 56, I received a card from him. He concluded, 'bend an elbow for me in Melbourne' — I had helped him find a cigar. In September 2003, ten years ago, my wife and I went to Dublin, having been in England to see our son who lives there, and I let Seamus know that we would be staying at the Schoolhouse Hotel, which turned out not to be too far from the Strand where he lived. Upon our arrival there were three notes waiting; the first suggested a meeting, the second drinks, the third 'Heigho, we'll have some scrags'. He picked us up in a Mercedes Benz. I said something about a poet and such a car, 'Never mind it's got a broken window'. He had just returned from Dundee where he had given that wonderful lecture 'Room to Rhyme' to graduating students and their parents. (Years later, having given away all my copies, I begged one of him. He sent the last he had. Being printed upside down 'might make it more valuable' — I don't know about that, but I do recommend it to anyone wanting to enter the world of writing. It's a gem.) The Lord Provost at Dundee had given him a bottle of rare scotch — Auchentoshan and a laurel wreath and the shell from a cannon fired in his honour. Find an inkling in smoked salmon and red wine. The palatable, in sweet remembrance, made durably palpable. Encircled and powdered that dictum. And makes congratulations into a festive frolic. It was a night of complete hospitality and he wrote a travel guide to Dublin for us, 'Fart around the Dart' (or Dublin Area Rapid Transit)! He was unfailingly polite and always responded to the birthday greetings I sent him each year in April. This year there was silence. I felt that something was amiss. He had written in 2006 saying he'd had a small stroke. He was then in high expectations of the arrival of a first grandchild. In the letter he included a copy of a get well card — 'His condition is improving rapidly — he is sitting up in bed blowing the froth off his medicine!' (Flann O'Brien). Sadly, Warfarin limited his 'froth'. I have always loved the 'Bog' poems and I read the book The Bog People that was useful to Seamus. It seems to me that those poems have made a new 'turf' for the preservation of the people dug up from the past. The past is made present, the new present is made a future. He gives a voice to them in his own voice, and the two will ring out so long as man reads. His language is tough, resilient and enduring. It is the language of the deep soil made flesh by the 'snug gun' in his hand. Digging is the beginning and the ending. We should rejoice at the spade-work and the love that went with it. He's back in his turf. To heave the harvest from the hosting soil. 'Ah yes,’ says Justin, 'germination grounds incarnation’. A day late mind you! To a distant edge where trees are thick. But the eels still slither, trout hoop upstream. Endow the times with a special glow. And the glorious company of word-weavers. Peter Gebhardt is a retired school principal and judge. His most recent book is Black and White Onyx: New and Selected Poems 1988–2011. This article was originally published on 4 September 2013. Thanks for re-publishing this one. I must have missed it in September. A gem!